Black with Orange/Gold/Red textured Dichroic glass stud earrings. There is a matching pendant and ring. 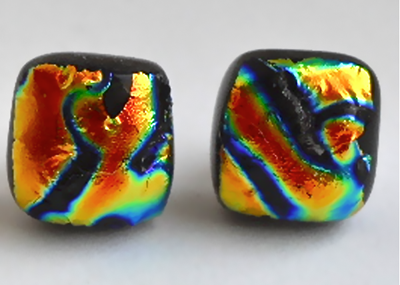 They measure 0.8cm x 0.7cm and are made of a layer of Black with Orange/Gold/Red heavily textured Dichroic glass. They have Sterling Silver fittings, and come in a Black card gift box.